Note: Our apologies for the lack of Travel-Logs during the past two weeks. It’s not that we haven’t been antiquing; we have. However, between very busy days on the road and sometimes very poor wi-fi connections at our motels in the evening, we’ve fallen behind. Here is our report from Abilene, Kansas. We hope to give you more reports from Florence, Colorado; Leadville, Colorado; Virginia City, Nevada; and Orange, California. In fact, after Abilene, we plan to jump ahead to the Now and Then Thrift Shop in Orange which we visited on 9/26/12. Then we’ll backtrack. Since the last report, we have seen some fabulous museums. First, we visited the Truman Presidential Library and Museum and the Truman house in Independence, Missouri on September 11. Then, we went into Kansas City to see the Steamboat Arabia Museum. This was a priority on our itinerary, and we’re so glad we saw it. The Arabia was a steamboat on the Missouri River that sank in 1856. Everyone on board survived, but the ship’s cargo went to the bottom of the river and stayed there for over 130 years. The course of the river changed, and the ship ended up underneath a Kansas farm field. It was excavated in 1988 and yielded an unbelievable treasure – dozens and dozens of boxes and barrels containing all sorts of sundry items for mid-nineteenth century pioneers. Dishes and utensils, tools, buttons and Indian trade beads, bolts of fabric, hats, and boots, bottles, perfume, and more are all on display in a dizzying array that boggles the mind. On September 12, we set off across Kansas and reached Abilene by late morning. Abilene was the boyhood home of Dwight Eisenhower, and his parents’ house, his presidential library, and his museum are all there to tour. Downtown Abilene is a typical Midwestern business district. Most of the buildings date to the late 1800’s and early 1900’s. Thankfully, many of them are thriving because they’ve been turned into antique shops and malls. We wish we had had more time to browse through the Abilene shops. We saw about five or six of them, and got into about three. (According to one website, there are a dozen shops in the town.) 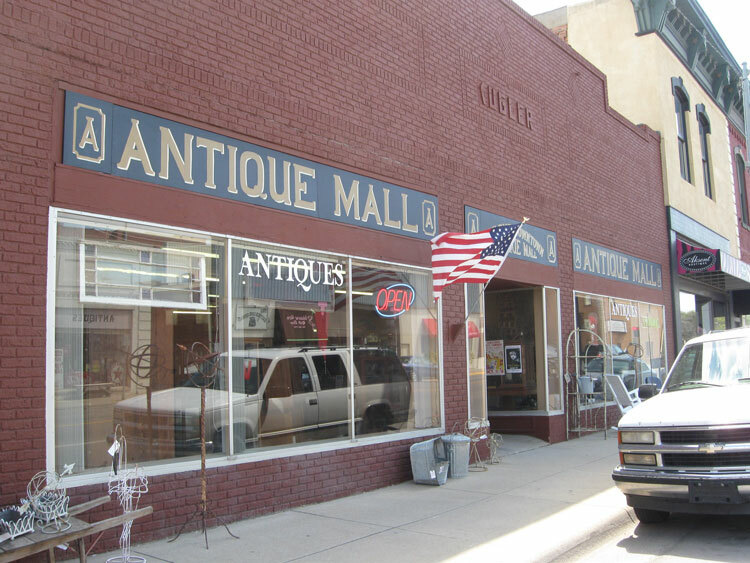 Mud Creek Antiques and the Downtown Antique Mall were side by side, and we thought both of them were impressive and well worth a visit. We could have easily spent more than we did, but Jim bought two items that he’s quite pleased with, both at Mud Creek. One of the first antiques that caught our eye when we walked in was a glass honeycomb fly/wasp catcher. 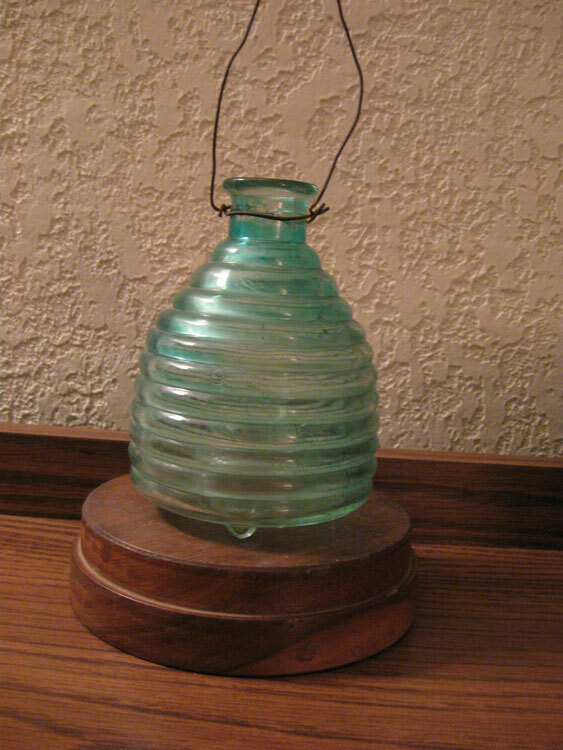 Made of ribbed glass in a beehive shape with openings at both the top and bottom, the fly catcher, which is about five or six inches in height, has a wire hanger at the top. It would have been plugged at the top. We don’t know if something was put inside to attract flies or wasps. I guess once they got in, they couldn’t figure how to get out. We thought $18 was a reasonable price for it. This is what the bottom looks like. The hole has been drilled out. The other item that really excited Jim was a cast iron advertising string holder. It’s the kind of country store item that we rarely see at an affordable price anymore. This string holder looks like a little footed kettle with a small hole in the bottom. The ball of string would sit in the opening of the “pot” with the line of string coming out the bottom. It could have sat on a countertop, but there are also handles on the kettle, so it’s possible that it could have been strung up and hung from an overhead beam or a ceiling. The neat thing about the string holder is the advertising. It says “S.S.S. for the Blood” on both sides. We had never heard of such a product, but it sounded like an early version of Geritol. Sure enough, once we were able to access the laptop, we googled it and there it was! S.S.S. for the Blood is a product that was first produced in 1826 and is still available today. Supposedly, the formula for the blood tonic comes from the Creek Indians. S.S.S. stands for Swift’s Southern Specific. Col. Charles Swift was the second person to possess the formula and offer it for sale. The S.S.S. Company is located in Atlanta, GA and is the oldest non-prescription drug manufacturer in the country. Often, the fun of antique collecting is doing the research and finding out obscure facts like these. 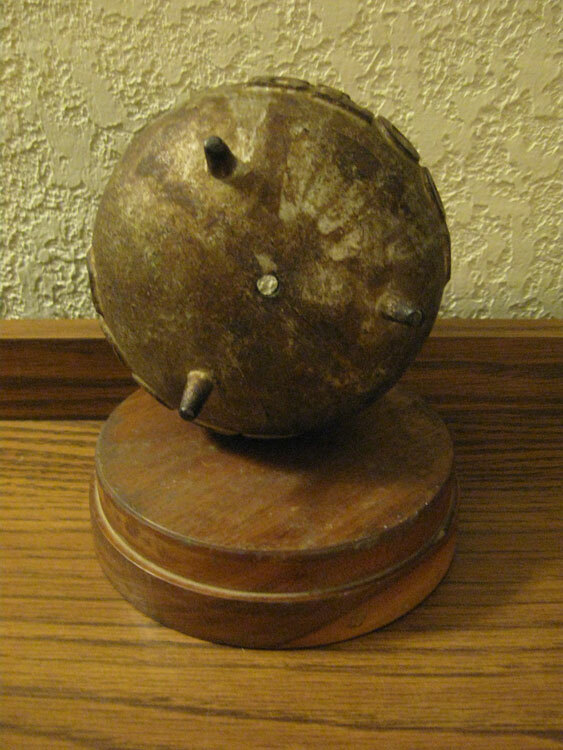 A string holder like this would probably date to about 1890-1910. Unfortunately, of course, antiques made of cast iron have often been reproduced. The classic cast iron beehive string holder certainly has been. That’s why collectors must proceed with caution when buying items like this. 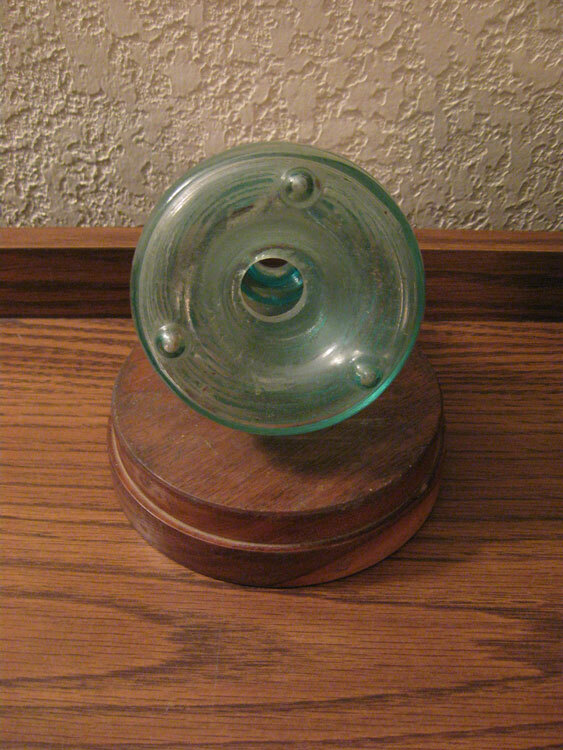 While Jim had little doubt that this string holder was the real deal, a check of eBay later on in the day showed that at least one string holder of this type has been reproduced. Numerous examples of a Jaxon Soap cast iron kettle-type string holder could be found on eBay. Obviously, a genuinely old string holder like that existed and someone unscrupulously copied it. We will certainly keep an eye out for more S.S.S. for the Blood string holders, but none have shown up on eBay recently, so that’s probably a good sign as to the authenticity of ours. This entry was posted in 1800's, 1900's, 1910's, Advertising, Americana, Carol, Cast Iron, Glass, Historical, Jim, Kitchen, Road Trip. Bookmark the permalink. 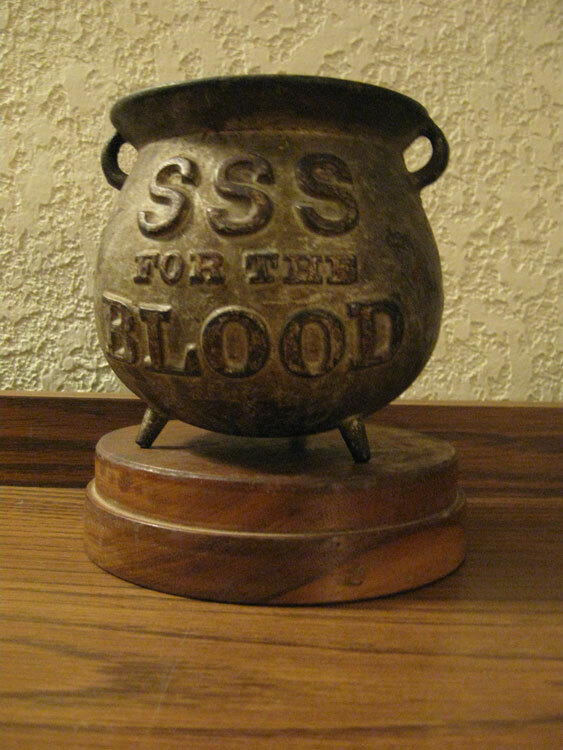 SSS for the blood. I have a string holder like the one you show. It is painted black and looks like the letters were once painted red. No handles and no base. I bought it on the way from San Antonio Tx to Hot Springs Ar at a little town we stopped in to get gas just before we crossed the state line.. I saw a sign in the pawn shop window saying it was closing. I went in and the owner said he would sell the holder along with a few other items I found interesting. The pawn shop had been there around twenty years and this was shelf decorations and could have been there for a longer or shorter time. I have had it for 6 months now and have it posted on our local craigslist for sale.